The product has been provided by VTech so I could experience it with my family; however, the thoughts and opinions are mine alone. You know those moms who think kids shouldn’t have tablets, because then it could turn into an electronic babysitter? I’m so not one of those! Not judging them in any way, it’s just not my own opinion. My kids have tablets – not their own, specifically, but ‘family tablets’ they’re allowed to use, with our permission. Not only is it great when I have an important 10 minute phone call and need them quiet, but it also can be educational! My new favorite, the VTech InnoTab MAX, not only let’s me monitor and adjust the security, but they can also have Fun While Learning with InnoTab! The VTech InnoTab MAX is targeted for ages 3-9, so it fits my three boys perfectly, while still being decently good for my 9-year-old girl. So what sets this apart from previous versions or tablets? The 7″ multi-touch screen has high resolution, and it uses a rechargeable Lithium battery. It’s ran by a powerful dual-core CPU with up to 6 times the processing power of previous generations. Yup, it’s a tough beast! It even has a progressive learning content that adapts to a child’s skill level – this is especially helpful for my little Thor. It’s awesome seeing him learn and progress through things – and it makes him so proud! They’ve built in fun little extras, such as an area where you kids can ‘WISH’ for apps they want – then you, the parent, can go in and see if you want to get that for them, or not. A neat idea, in my opinion! As far as safety is concerned, it has kid-safe Wi-Fi and Web Browser to they can explore online games, videos and websites that were pre-selected by VTech. Using the easy-to-navigate Parental Controls, you can manage their apps, web access and even set limits and rules to their tablet time. It allows you to track their learning development, too, which is AWESOME! My Android-loving hubby was thrilled to learn it uses Android! It’s available in blue or pink, and would make a FABULOUS Christmas or birthday gift! 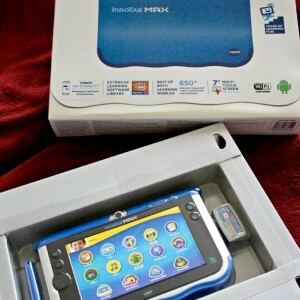 And You Can Win a VTech InnoTab MAX just in time for the holidays!